S1 pupils read poems to the P7’s in Glow Meet and there was a question and answer session. The teacher then provided a session on how to write poetry. A High School maths dept. set monthly puzzles for the P7’s. This gave the teachers valuable insight into the levels that the P7’s were working at. A P.E. dept. had a huge amount of questions asked about their subject and it gave them an insight as to how the P7’s were feeling. The English Dept. gave the P7’s the task of writing a hallowe’en story. The feeder primary school children held back until the last minute to post their stories because they didn’t want their ideas to be ‘hijacked’. Our local Authority has just recently signed up for GLOW, so it’s too early to be thinking about using it as a vehicle to support the changeover from primary to secondary. The first one is a link between some Primary 6 children and the Art Department at their local High School. It’s hoped that senior pupils will be involved, too. Evelyn is going to showcase the children’s artwork on the blog, and we’re hoping that the primary 6 children will use the class blog and perhaps their online wiki spaces to discuss their artwork. 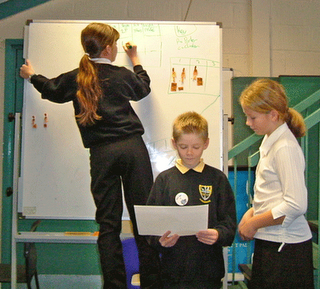 The children in this particular class used these spaces last session with Cassie, their probationer teacher. The aim is to get feedback from High School in the form of comments. The second idea is to create a link with the same set of pupils and the maths department of the High School. I’m hoping to work with the class teacher, another teacher who has recently been seconded to promote CfE and numeracy across the curriculum and a teacher from the High School maths department.